I’ve been convinced for the last year or so that the only thing standing between me and really incredible, Martha Stewart-level dinner parties was our lack of a dining room table. I mean, obviously the problem couldn’t be my all-consuming exhaustion, lack of enviable cooking skills, or inability to lure friends out of their houses with anything short of a steady rainfall of chocolate and booze. No, no, the table is clearly the problem. It’s not that I haven’t been looking for a table. Oh, I’ve been looking. But I can’t buy a nice table because I know that Michael has a vision for making one. I’m sure that this future, handmade-with-love, one-of-a-kind piece will be beautiful, and I am eager to see it, but there are many other pressing concerns that take precedence over buying a bunch of hardwood for a table. I’ve been searching for months for a used one that will serve while I wait for the masterpiece, but so far everything I’ve found has been too small, too big, too ugly, or $1,500. Anyway, at the end of the day or at least this complaint session, we have no table that can seat more than four with any level of comfort. I bemoan this fact with regularity, usually during some kind of passing crisis over not having a social life. So that’s the lengthy background behind my reaction on this past Saturday, which is when Michael casually mentioned that he had invited some friends over for dinner on Monday. I should have been excited, right? People were coming to dinner! I wasn’t excited. That’s salvaged wood from old shipping crates. He topped it with a piece of plywood that’s been propped up against the dining room wall for about a year now. Then I threw some linens and every candle in the house on it, surrounded it with the kitchen chairs, the bench/coffee table from the living room, and Annabel’s bench seat from kitchen, and made my eyes and my brain really soft-focus. Just like that, dinner for seven. It worked just fine. I’m very excited to have people over for dinner now. 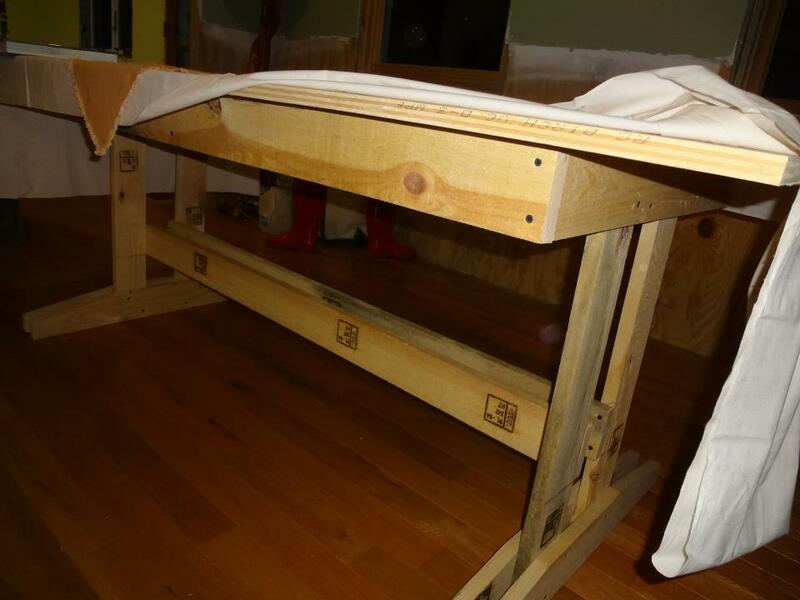 But I’d better do it quickly because I’ve been informed that Michael will be needing that piece of plywood back for Memorial Day weekend, which is when it will be turned into the other kitchen bench seat. I suppose it’s best that we have a deadline. I’ve been sleeping on a bed made from 2x4s and plywood for about seven years now. You know, the temporary one. I have been trying to put this post up for months. First I had to wait until the house was clean enough to take pictures. That took a while. Once that miracle occurred, I took some pictures of the kitchen and started to compose a post and then, and I am not making this up, Michael changed stuff. He did work on the kitchen, work that I’d been waiting on for, um, a while. So then I had to take new pictures, of course, that reflected the new work. Which meant I had to wait for my house to be clean again. And then, just before we left for vacation, it was! We were going to have a housesitter and nothing makes me more paranoid about the state of my house than other people seeing it. So I spent hours cleaning for this housesitter and it wasn’t until I was done that I realized the housesitter was a twenty-something male. Chances are good that, unless twenty-something males have changed considerably since I was a twenty-something female, he wasn’t going to care that much that I cleaned the crevices of the stove with a toothpick. But you will care, so here’s a peek at the current state of my sad little half-built house. The downstairs anyway. For starters, the kitchen. For some reason I took 100 pictures of my kitchen, possibly because I spend most of my life there. From the back door, which is that door we most often use given our front porch’s tendency to be overtaken with saws, scrap wood, and various discarded junk from Michael’s periodic truck clean-outs. We never use the front door, but you can see it on the other end of the house. Hello, front door! We love you! Notably missing from my kitchen: any kind of trim. 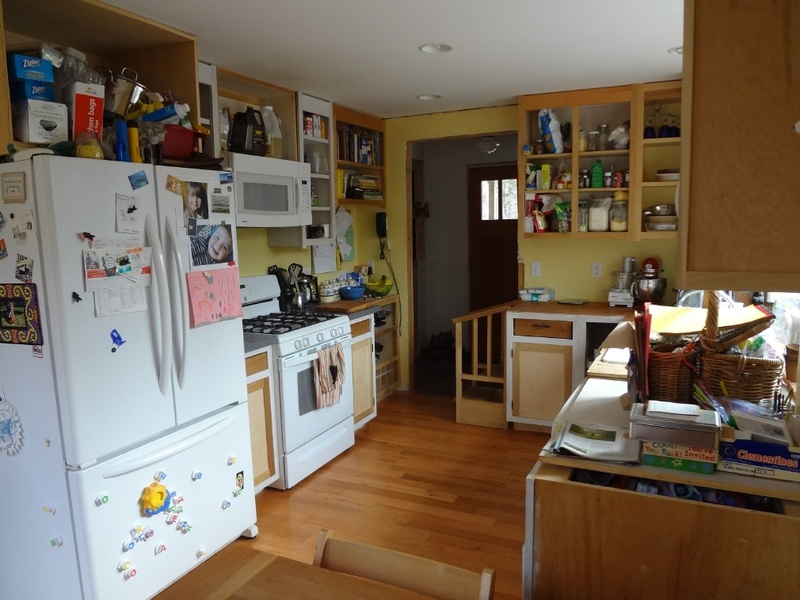 Also, those upper cabinets on the left are supposed to have doors on them. And all the cabinets are supposed to be painted white. And my countertops are not supposed to be scrap plywood. They are supposed to be butcher block. If you turn to the right immediately after entering, you would see our eating area. 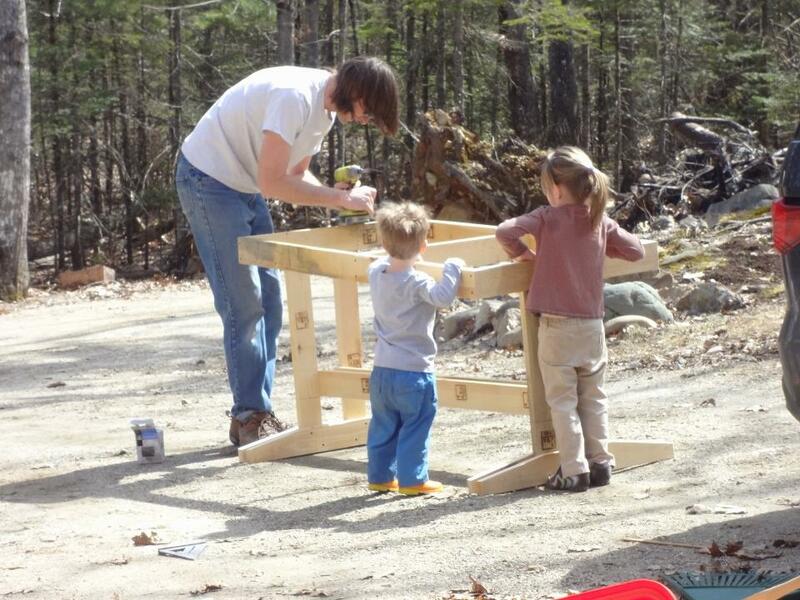 Michael built the table a few years ago. I quite like it. 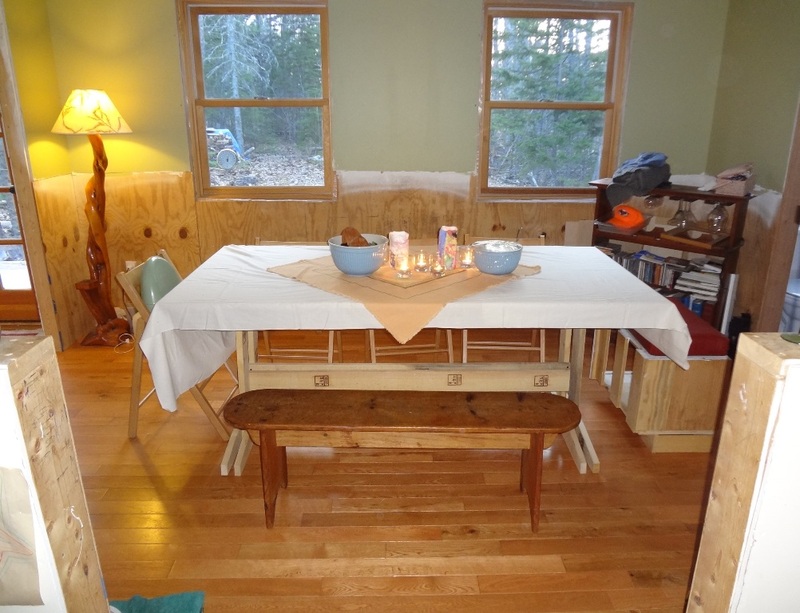 You can see the beginnings of a bench seat on the left side of the table. The right side is supposed to have a full bench as well, hence the incomplete paint job. Someday. Also someday, a lighting fixture that isn’t a lightbulb on a string. Still no trim. Trim is for wimps. Are you tired of looking at my kitchen yet? Too bad. Other side of the kitchen from behind the table. That giant pile of junk on the right is the “art center” though I like to think of it as where craft supplies go to die. 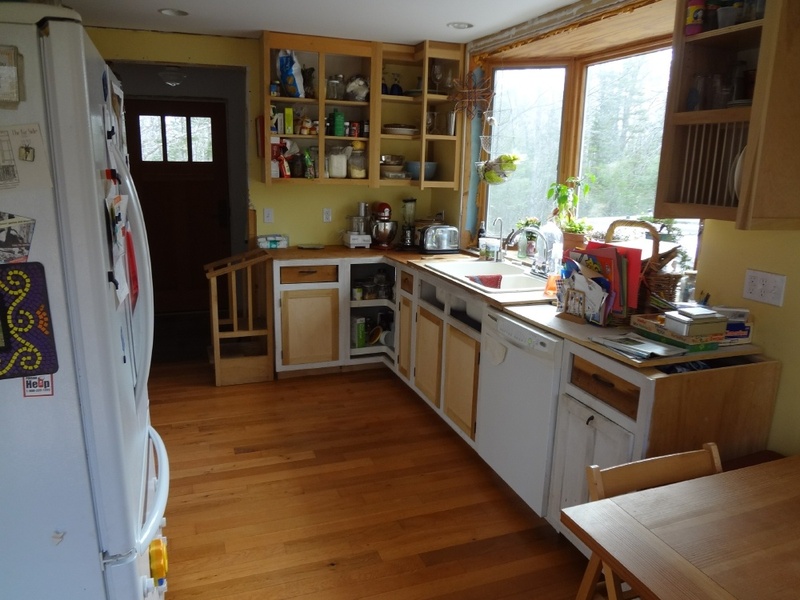 The cabinets above the fridge and microwave are supposed to have shelves. And face frames. And doors. And other things like that in order to distinguish them from being giant boxes containing piles of crap. 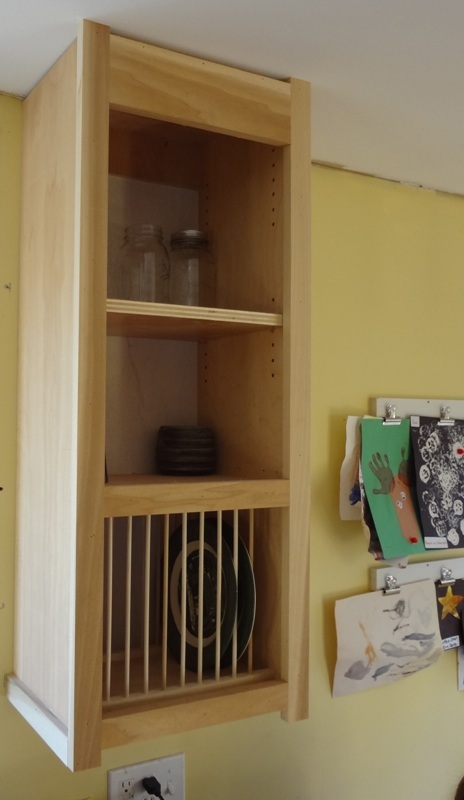 Here’s a little close-up of the bookshelf/wine rack/cookie sheet cabinet because I do think it’s a nifty little use of space. Hi, Annabel. Glad to see you are still in your pajamas at what was likely 11 a.m. The kitchen from the other side.The sink we have in there is temporary. It wasn’t intended to be temporary, but it turns out that the “easy care, easy clean Swanstone” that it is made from is actually the most stain-able surface on earth and, thus, our sink always looks disgusting. 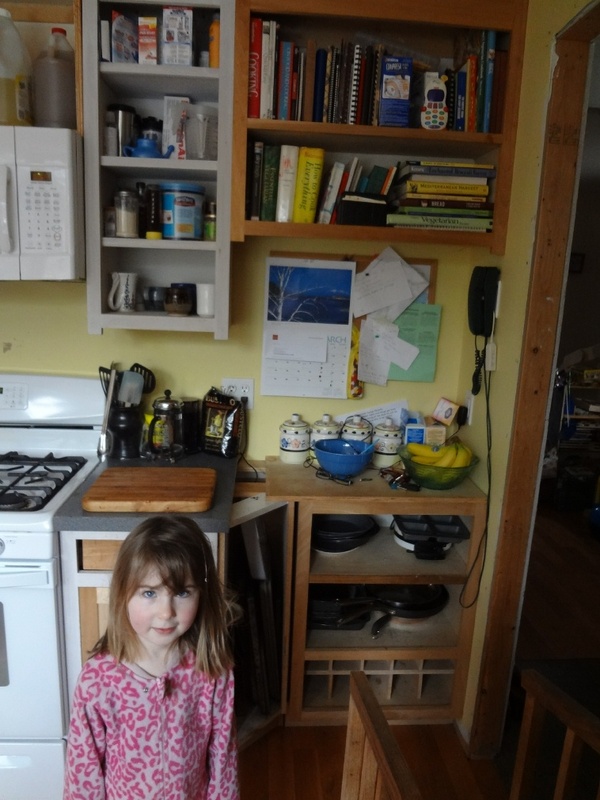 We have a replacement enameled Americast sink down in the basement which will be installed when we put in the butcher block countertops. Which will be when? That’s right. Never. You are catching on. Do you care about my kitchen anymore? You’ve moved on? Great. Me too. Living room! Yes, this is what my living room looks like when it is super clean. It depresses me too. Do I even need to tell you what’s missing here? Trim, yes. Real people stairs, yes. Granite woodstove surround, yes. 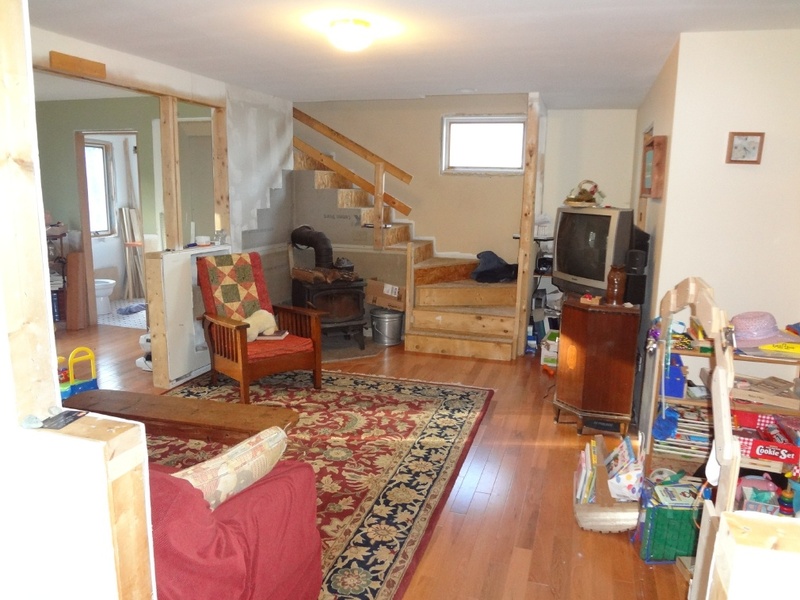 Bannisters for the stairs that aren’t 2x4s, yes. Pretty columns on the half-wall between the living room and dining room, yes. A built-in desk at the bottom of the stairs, yes. An immense toy clean-out, YES. Living room from the stairs. You can see a glimpse of the [front door] entryway there on the left. That closet will someday have doors. The little niche in the half-wall beside the couch is supposed to have shelves in it and be all pretty. Just like the mythical pretty columns and light fixtures in the alcove. Have I mentioned yet that my house requires a lot of imagination? Living room from the dining room, mostly so you can see the awesome playtent Michael built for the kids, although it isn’t tent-y at the moment. Mostly it’s a toy corral. It works. Kind of. 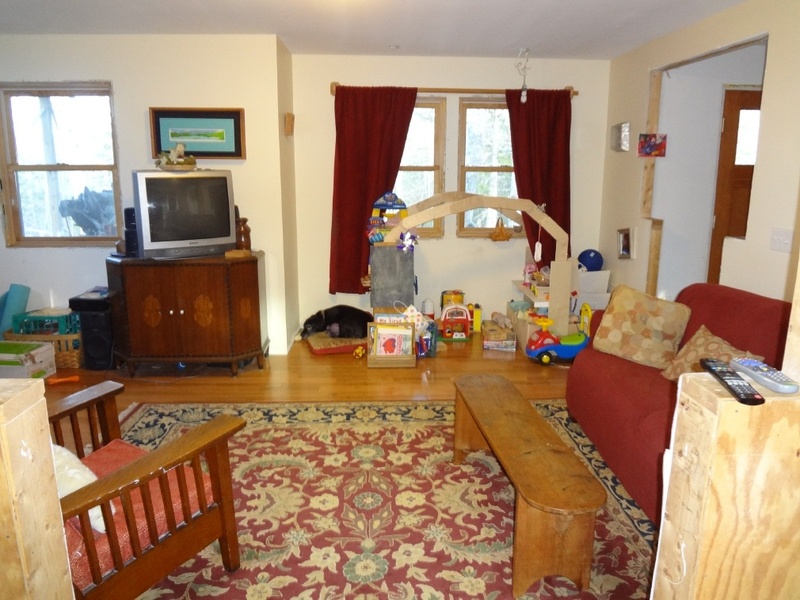 Someday when the kids no longer need a toy corral, that alcove will contain a built-in bench seat and book shelves. Michael would likely want me to point out the television, which is about 15 years old. He wants a flat-screen to mount on that wall. He can have a flat-screen. As soon as I have butcher block countertops. Do you see how this works, this thing we call marriage? It’s all about mutual suffering. That’s the chop saw that you see through the window. Aaaahhh…relaxing. Finally, the dining room. Which, you might notice, is missing a little something that dining rooms usually have. Ah, well, we don’t have room for a table anyway. Where would we put the chicken feed, kindling, and dog food? 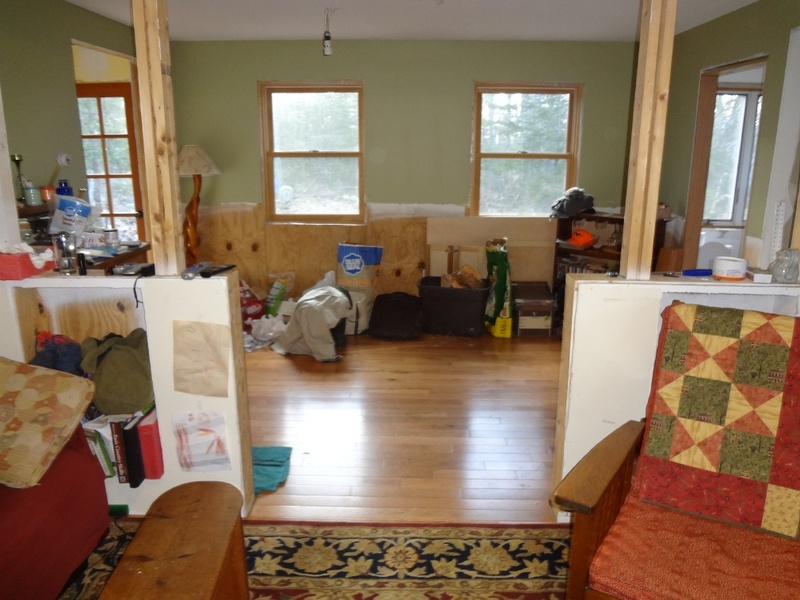 The bottom half of the wall is plywood because it will someday be wainscoting. That’s my house. Send help. Send therapy. 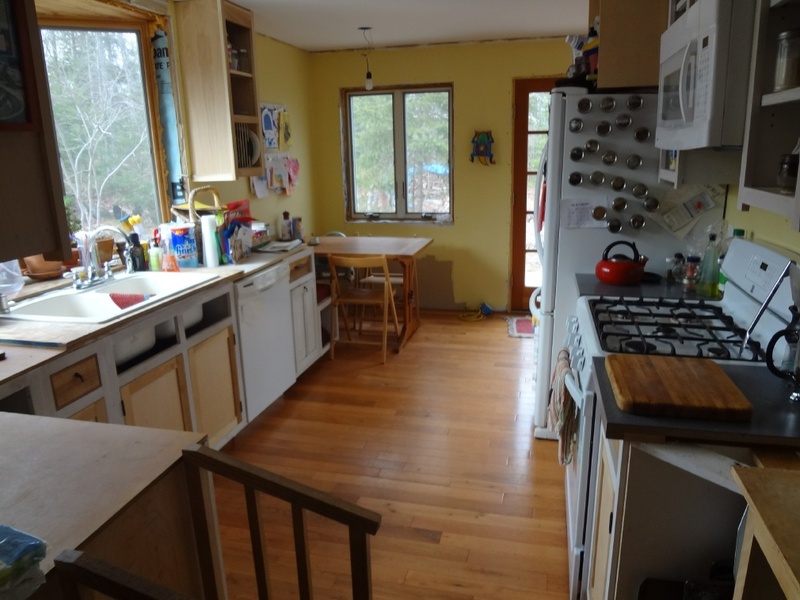 Send butcher block countertops. And stay tuned to find out what major thing Michael did after I took pictures this time. I think there are some new readers around here and I think they are confused by the we-built-our-house thing. As I’ve mentioned before, there’s an old blog, with lots of broken picture links, covering the entire episode in exhaustive detail. If you want to know what a rat slab is and why we have one, go there. This here is the short version. October 2003 Michael and I get married. 2003-2005 We lead a blissful, simple life in a centrally-located, completely affordable rental house with ample amenities and generally pleasant landlords who like us. Naturally, we decide this situation must change. Fall 2005 We look for houses in our area. Everything is either 1) twice as much as we can possibly get a mortgage approved for or 2) thirteen seconds and one strong wind from collapsing into the basement. We decide building a house is the most brilliant idea ever and plus it will be so much fun. 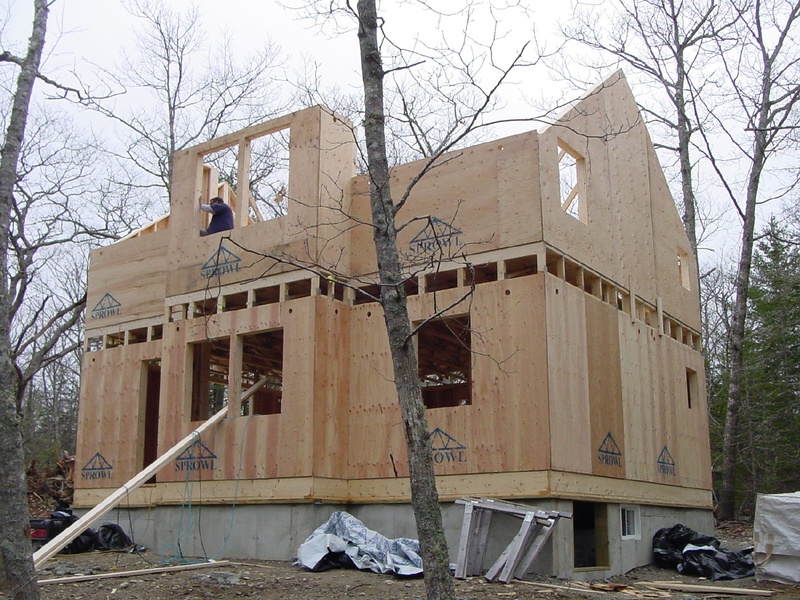 We can’t imagine why everyone doesn’t build a house! 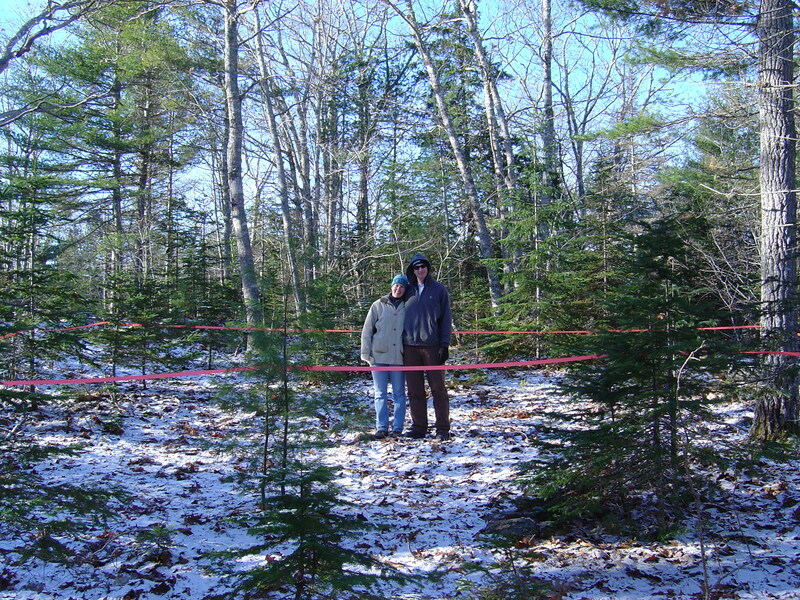 January 2006 We buy a 3.5 acre parcel on a wooded hill with a lot of granite ledge. We take the first picture of our house. We are young and stupid and it still hasn’t occurred to us that this is a really bad idea. Even though it was about ten degrees that day. 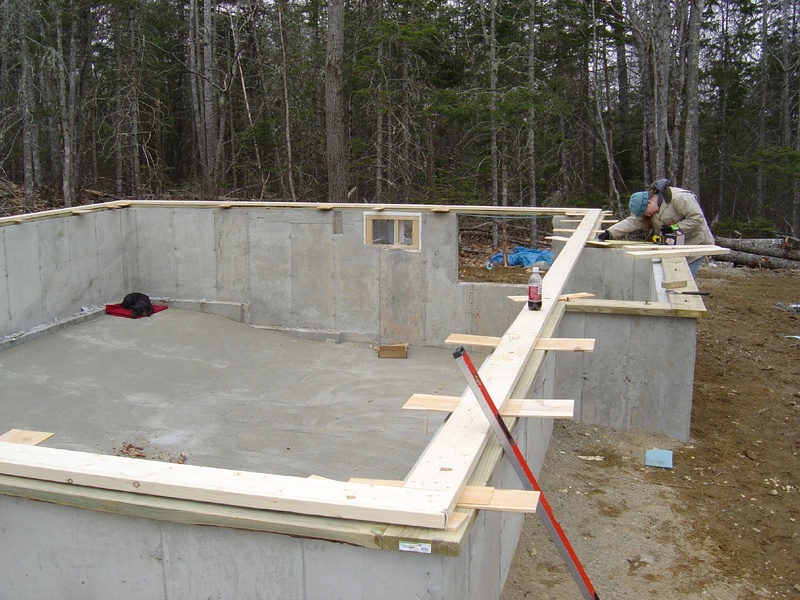 March 2006 Foundation is poured. Yes, that’s me. I have no idea what I was doing. April 2006 Exteriors walls are up. That’s our friend Mark. I have no idea what he was doing, either. Look, I kept a blog. I didn’t keep notes. April-September 2006 We work unbelievably hard, hemorrhage money in a spectacular fashion, and fight almost daily. Basically, we are camping in our own house. These are grim days, as you can tell from the dog’s expression. Grim days, indeed. 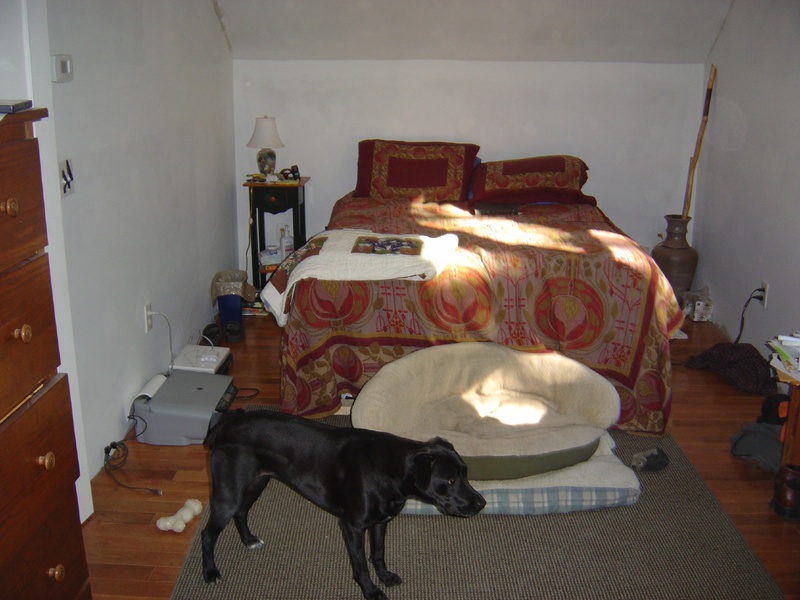 September 2006-February 2007 We steadily chip away at making rooms habitable. Gradually, we have a fully functioning kitchen, a bathroom with an actual sink, and a guest room that serves as our living room. We are still living almost entirely on the second floor. February 2007 Uh-oh. Cherie’s pregnant. The kid’s probably going to want a living room, eh? And it’s probably not supposed to have a table saw in it, right? February-November 2007 Hurry, hurry! Get the downstairs finished! 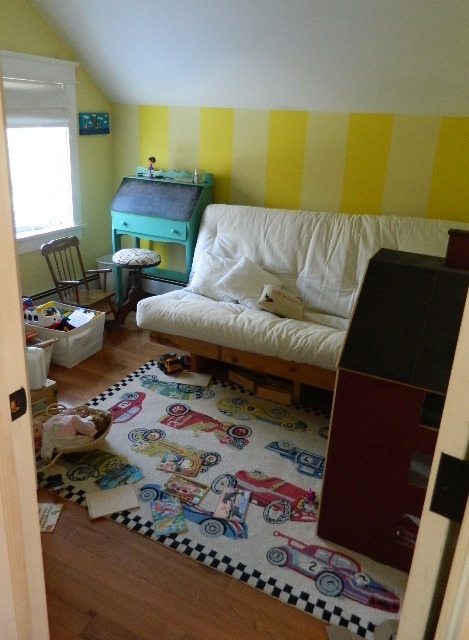 Hang drywall, install floors, make a nursery! Other women buy fluffy crib bedding when their nesting instinct hits. I shingled. 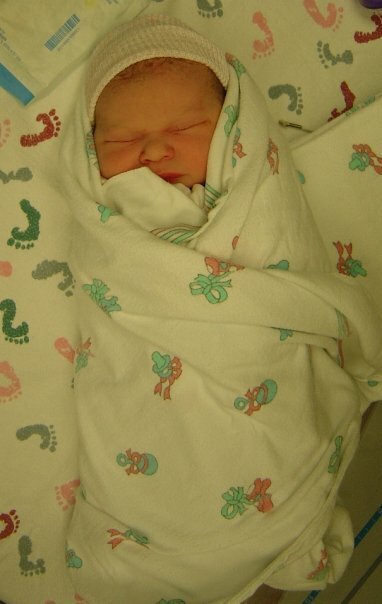 November 2007 Annabel is born. November 2007-October 2008 Nothing happens. I mean, we make a few kitchen drawers, we put up a few more shingles, we tinker here and there, but for the most part, there is no significant progress. 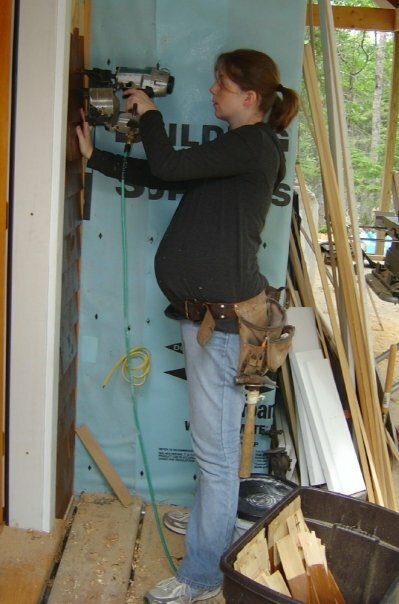 It turns out that having a baby makes building a house nearly impossible. We probably should have thought this whole thing through a little better. 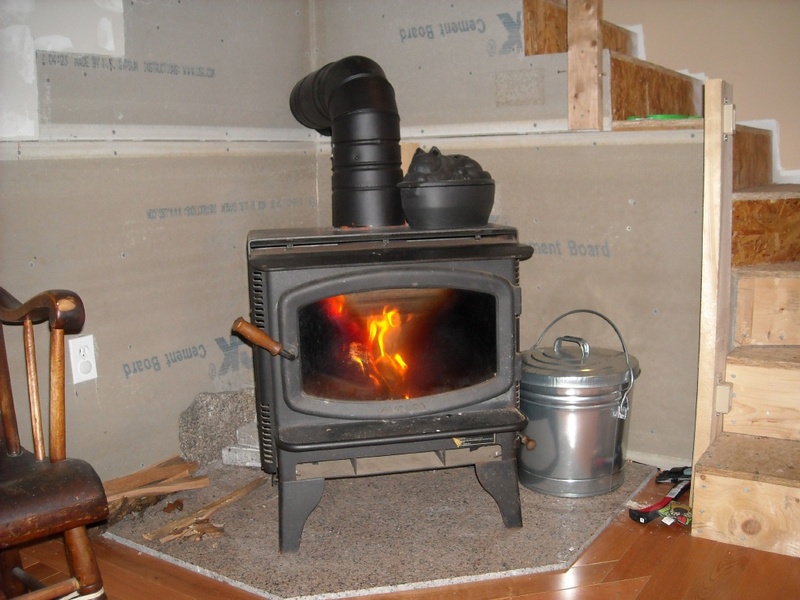 November 2008 We install the woodstove. That may not seem significant, but that’s only because you aren’t me. Trust me. It was significant. November 2008-May 2009 Nothing happens. May 2009 Uh-oh. Cherie’s pregnant again. Hurry! Hurry! 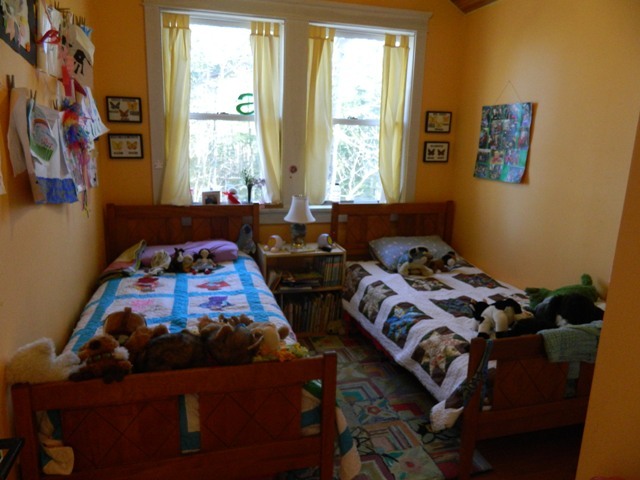 Finish the larger spare bedroom and move Annabel in! Except not really, because who can summon that kind of energy with a two-year old around? May 2009-January 2010 Nothing happens, but we talk a lot about doing something. 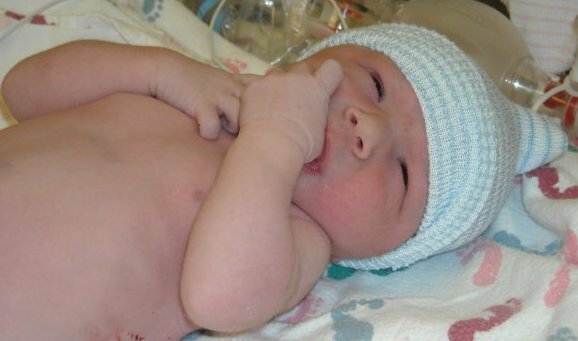 February 2010 Sam is born. Not coincidentally, Annabel gets a new bedroom. I don’t have a picture of that for some reason. February 2010-October 2011 Nothing happens. 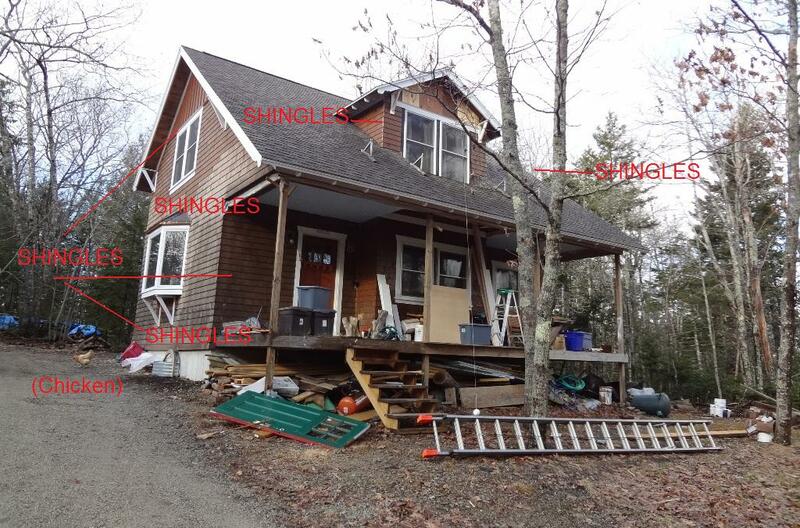 Well, you know, shingling. That happens in fits and starts like always. October 2011 The shingling is done! October 2011-January 2012 Nothing happens. So! There we are. I plan on doing a little tour of the house soon for those interested in such a thing. Also, if you would like to see the vision for the house, how the house appears in our heads and not in reality, I’ve added a tab at the top for it. There’s the full story to date. Now you know. And that twitch in my left eye is fully explained. I have a lot of complaints about the trials I undergo as a result of Michael’s job. I’ve joked about beginning a support group for other carpenter’s wives, tentatively named “The Carhartt Widows.” I’ve written, in theory only, sadly, a country song entitled “Drill Bits in My Dryer and Sawdust in My Sheets.” I mutter obviously as I sweep up yet another full dust-pan of job site gravel. And the eyerolling I perform during the eight-hour cleaning process (drills, receipts, scrap wood, saws, architectural plans, three bags of trash) that is required whenever someone needs to sit in the passenger seat of the truck will, in all likelihood, injure me someday. Yeah, that part’s pretty awesome. I still hate the drills bits thing, though. You see crap under the porch. You see crap on the porch. You see the skeleton of scaffolding on the roof. You see a mishmash of paint, some faded, some not, some nonexistent. You see a landscape that looks like a bomb site. The shingling, people. The shingling is done. I mean, yes, it took us so long to finish shingling that the stain has faded in some spots to the point of needing to be redone. But you know what? We were going to redo it anyway once all the shingles were up. So that totally does not count. Somewhere on here I promised to start writing about the housebuilding project again once the shingling was done. Say it with me: the shingling is DONE. *Actually, the shingling was completed in October. But I didn’t want to write about it until the rest of the barn board on the dormer was stained. It appears that is not going to happen until summer. I can’t wait until summer. I’m declaring it done. Annabel is going through a phase where she asks constantly who “made” something for her. This isn’t as odd as it sounds. With one grandmother who knits and another who sews, a father who used to be a potter and who can turn scrap wood into a table, a mother who spends an awful lot of time baking and doing crappy crafts, and lots of other handy aunts, uncles, and friends, the proportion of “made” things to “bought” things in her life is actually pretty high. And sometimes she just likes to identify some of these things. The other morning she launched into a round of “Who made?” She held up the bowl she was using. Suitably impressed, she held up her arm to show her sweater. She looked around the room and pointed to the table. She glanced down at the floor. And I was suddenly very proud. If you came over here from the houseblog, you know that we built the house we live in from the ground up. Some days we think this was the stupidest decision we’ve ever made. Some days we think it was the smartest. 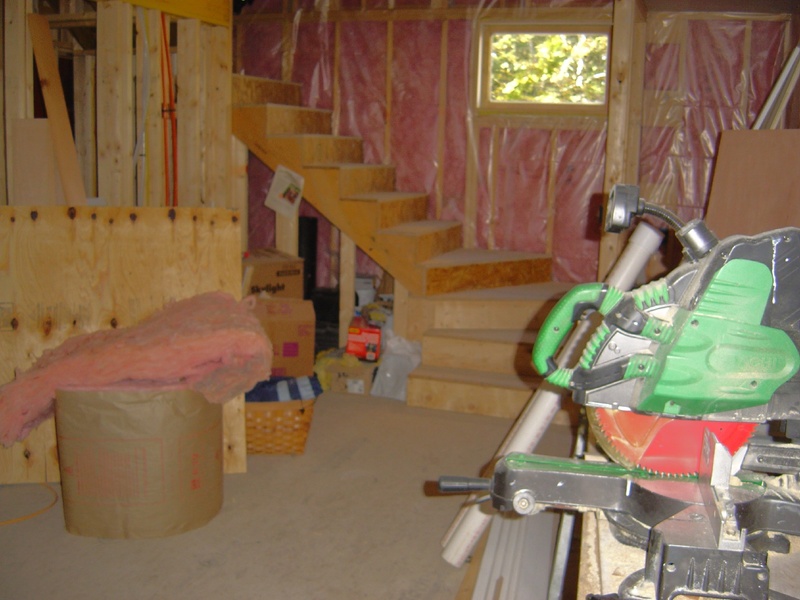 Most days we forget that not everyone has plywood countertops, exposed wiring, and a 2 x 4 bannister and we don’t think about the decision at all. As anyone who has built a house around themselves or undergone extensive house renovations would agree, after a while you stop seeing a building project and just see your house. It’s because of this sanity-preserving selective blindness that I feel like I need to explain a bit about the house on this blog. 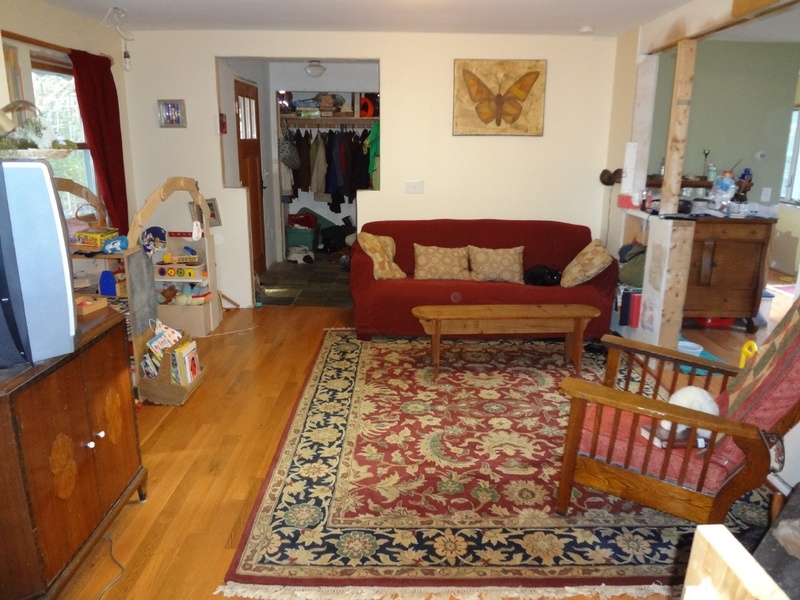 I feel like I need to give a little tour of what I live in, because when someone sees a picture of my house here and there’s exposed cement board behind the woodstove and windows without trim, I want them to know that I know. Okay? I know. It’s weird and it’s odd and it’s ugly and it will get better but for right now: this is my house. And it’s an awesome house. It’s crappy and awesome simultaneously. And we made it for her. 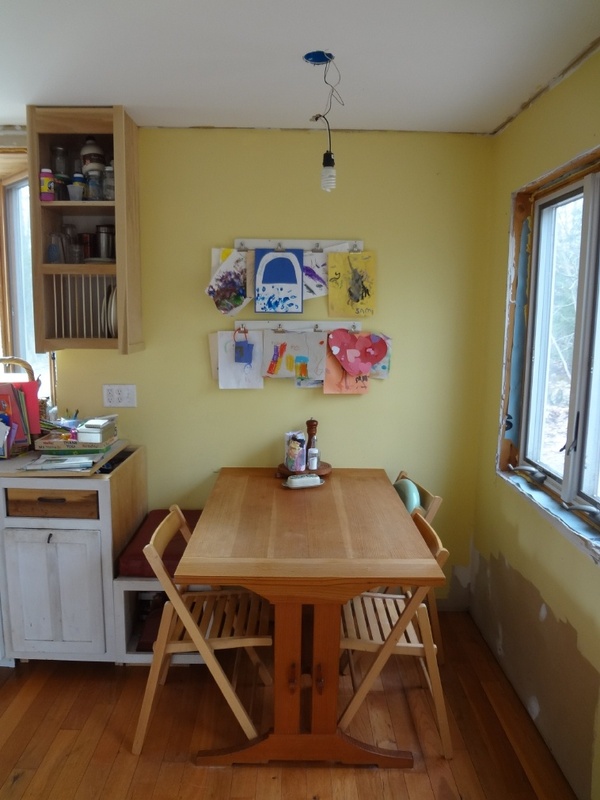 So before I launch into posts that detail everything that is wrong or odd or unfinished about our house (and there is so, so much), first I need to let you know that, yes, our house is crapsome. And we’re kind of proud of that.